Search Results for "arab family"
Dubai, UAE - January 12, 2018: arab people walking on night entertainment park Global Village in Dubai city. Arab family with child resting in in amusement park in Dubai city UAE. Dubai, UAE - January 18, 2018: arab family with children resting at tables in pavilions with canopies in Miracle Garden Dubai. Visitors drinking tea and relaxing in evening cafes Dubai Miracle Garden. Arab family presents gift box to the daughter on white background. Dubai, UAE - January 18, 2018: arab family and tourist people walking in residential area with modern business skyscrapers and luxury apartment in Dubai city UAE. Dubai, UAE - January 11, 2018: arab family feeding seagulls which flying over water on promenade in Dubai Marina UAE in United Arab Emirates. Arab family passing a good time under a tree during sunset. Djerba/Tunisia- CIRCA February 2019: Young Arab/Muslim family members take selfie (photo) at restaurant situated atop seaside cliff overlooking scenic bay, beach, and yacht club below. DUBAI, UNITED ARAB EMIRATES, UAE - NOVEMBER 20, 2017: View of luxury 5 stars JUMEIRAH BEACH HOTEL , near Burj al Arab. relax near swimming pool in sun rays, family vacation. Father setting up a camera with timer on a tripod for a family picture in a beach nearby the Burj Al Arab during morning in Jumeirah, Dubai, United Arab Emirates. Dubai, UAE - January 18, 2018: tourist family walking in luxury jewelery shop in Dubai city. Famous Gold Market with traditional arabian jewelry and expensive gold store. 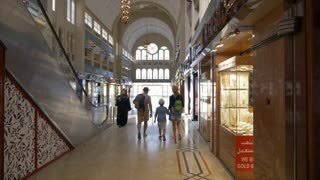 Dubai, UAE - January 18, 2018: tourist family walking in famous gold souk in Dubai city UAE. People walking inside gold store with traditional arabian architecture and expensive jewelry showcases. Caring handsome bearded single father with happy elementary age son on his shoulders ironing clothes together in domestic room. Positive stay-at-home dad and son doing housework and chores at home.